It’s beginning to look a lot like Rex-mas! Book 2 in the Cookiesaurus Rex series. Cookiesaurus Rex may not be your usual holiday treat, but he has plenty of Christmas spirit. He would like nothing more than to make it onto Santa’s cookie plate. After all, the Big Guy should have only the best cookie to take back to the North Pole. But Mr. Spatula chooses Star, then Bell, and finally Gingerbread Boy instead…. WAIT ONE STINKIN’, STOMPIN’, MINUTE! Looks like Cookiesaurus Rex is going to have to take matters into his own tiny arms. Will his Christmas wish come true, or will his holiday dreams be crumbled? Ready for more Christmas fun? 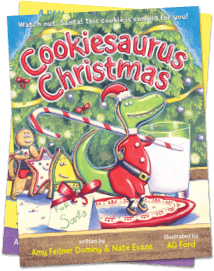 Download these coloring sheets with scenes from Cookiesaurus Christmas.